Mush! It's dog sledding time! Welcome to Alaska, where your team of dogs led by the Musher of your choice is ready to compete in the Iditarod. 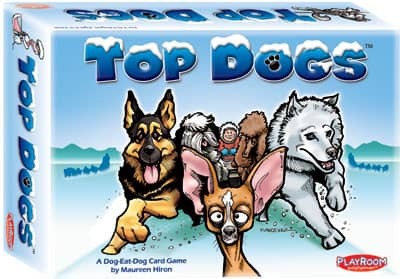 In Top Dogs, players must pick their best combinations of dogs to form the strongest team to compete for each race and win the trophies of different values. But, other players have the same dogs to choose from and the competition can become sneaky! As soon as each player has chosen their team, each set of dogs are evaluated for team strength and the trophy is awarded. So jump on your toboggan and choose wisely in this dog-eat-dog game of psyching out opponents. For 3 to 5 Players, ages 8 to Adult.